Both budgies (parakeets) and finches are friendly birds that get along well with others, but there are inherent problems with keeping two dramatically different types of birds together, especially in the same cage. There are a few types of finches that can be housed together with budgies but the bird owner should make sure all of the birds have enough space or fighting can occur. Budgies are a type of bird that are known as hook bills. Similar to parrots, these birds have strong downwardly hooked bills and can be aggressive in nature. Housing budgies with softer billed birds, such as most specimens of finches, can result in the smaller, weaker finches getting injured or even killed during budgie attacks. This is especially true when the two kinds of birds are kept in the same cage together. Housing the birds separately makes sense. There are a few finches that can live in proximity with budgies, including the nutmeg mannikin (Lonchrua punctulata), which is also known as the spice finch, scaly-breasted munia and spotted munia. Another agreeable finch is the white-backed munia (Lonchura striata) also known as the striated finch, sharp-tailed finch and wild Bangalese finch. Then there is the Java sparrow (Lonchura oryzivora), and the Double-barred finch (Taeniopygia bichenovii) that hails from Australia just like budgies. 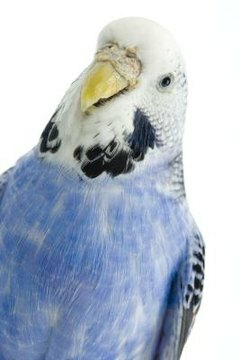 Budgies are larger than most finches but not as energetic. The smaller birds are playful and are constantly flitting about so they need plenty of room to fly. They also need room to get away from budgies that might be grumpier than usual. This means that in order to keep the two kinds of birds together, a very large cage would be needed. It may be easier to build an aviary to house the birds. To house both parakeets and finches together, the aviary should be at least 10 square feet wide, and provide plenty of perches for the gregarious finches to rest on. There must be a lot of room for the finches to be able to get away from the more aggressive budgies. Many times the finches and budgies will eat the same food, so this makes it easier to feed the birds in the communal living situation.